Fashion and architecture are more than casual acquaintances. Both disciplines entail filling voids with contours, swoops, and planes, albeit on markedly different scales. Sometimes, however, the cross-pollination of concepts is intentional. As fashion terms like “draping,” “weaving,” and “pleating” propagate throughout the architectural world, and methods of building construction incorporate themselves into garment-making, the relationship between the two grows more intimate by the day. From bridge-like pumps to a hat based on the London Zoo’s penguin exhibit, here are nine examples of their love affair. This content series is brought to you in partnership with smartwater. smartwater, good taste travels well. To learn more click here. 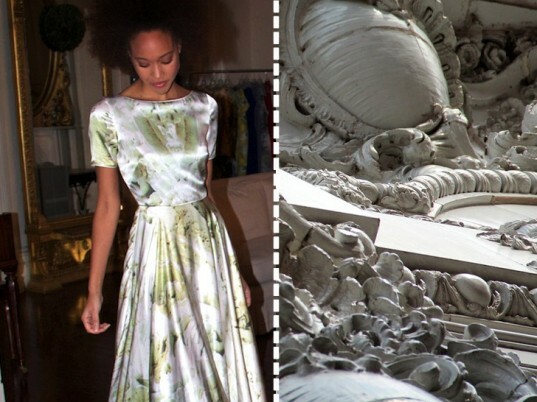 For “Crescent Rising,” CrOp by David Peck’s Spring/Summer 2012 collection, designer David Peck drew his cues from New Orlean’s vibrant landscape and architecture, including the historic Monteleone Hotel, whose Beaux-Arts friezes inspired one of his prints. To raise money for the World Wildlife Foundation, British architect Zaha Hadid borrowed a page from her own playbook. 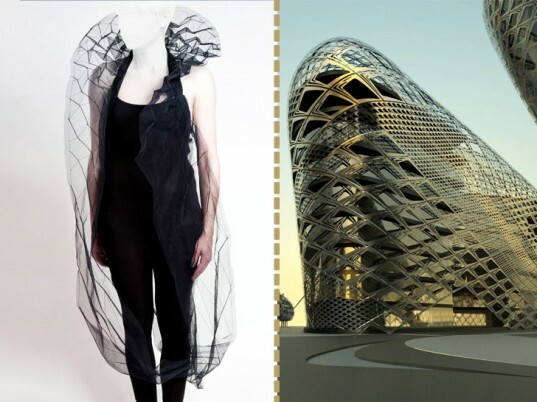 Frozen Aura, a flowing mesh dress, evokes the organic dynamism of her world-famous buildings, particularly the ThyssenKrupp headquarters in Germany. Marmol Radziner’s line of jewelry isn’t just inspired by architecture, it’s derived from actual construction scrap. The unisex rings and bracelets echo the sleek, fuss-free silhouettes of the design-build firm’s award-winning prefabs, resulting in personal architectural fragments that “evolve in response to [their] wearer,” according to Ron Radziner. When Yesterday’s News commissioned Lara Miller to create a tea-dyed frock out of newspaper, the Chicago designer didn’t have to look far for inspiration. Her muse? The Aqua, a Leadership in Energy and Environmental Design-certified “post-architectural” skyscraper by award-winning architect Jeanne Gang. Project Runway winner Gretchen Jones counts the geodesic structures of Buckminster Fuller among her myriad influences, particularly with her Fall/Winter 2011 debut collection. Jones had a hand in the jewelry that complements each look, several of which harken to Fuller’s self-bracing triangular forms. Galia Solomonoff was among the architects who lent their expertise to the 2011 “Scarfitecture” project, a cross-cultural initiative designed to fete the skills and abilities of artisans in Guatemala. Solomonoff based her design on the structural roof she designed for the Biblioteca Central del Bicentenario de la Ciudad in Rosario, Argentina. Reduced to abstract lines, the design morphed into a color-blocked shawl in soothing hues of blue. It should come as little surprise that Gaetano Pesce’s first foray into footwear follows the same mold as his trademark modular designs. The Italian architect’s “DIY bootie” for Melissa Plastic Dreams shares a thematic synergy with his plant-covered Organic Building in Osaka, Japan. Both feature undulating, interlocking components that can be tweaked individually at will. Talk about a shoe fit for a modern-day Cinderella. Made to order from three-dimensionally printed nylon, Continuum Fashion’s “Strvct” features the same triangulated buttressing that gives bridges their strength. Unlike actual bridges, however, the pump is wearable. Lined with a patent-leather inner sole, the shoe includes a coating of synthetic rubber on the bottom for traction. 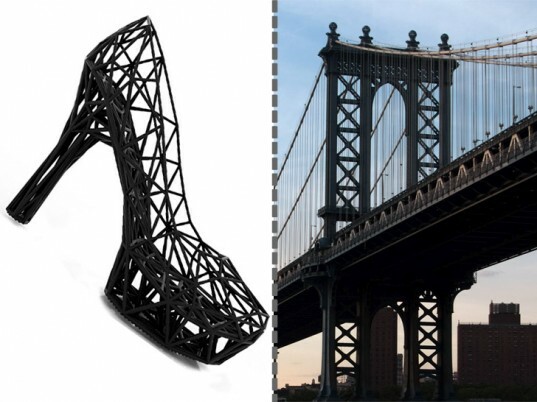 love the heels inspired by the Manhattan Bridge. though i'm curious how my feet would hold up in those after 10 minutes. Love that Gretchen Jones necklace! where can i buy the marmol radziner bracelets. love those! It's tremendously inspiring to see the flourishing network of connections between these fields! Love the Gretchen Jones jewelry & the Marmol Radziner bracelets! Great post, Jasmin! 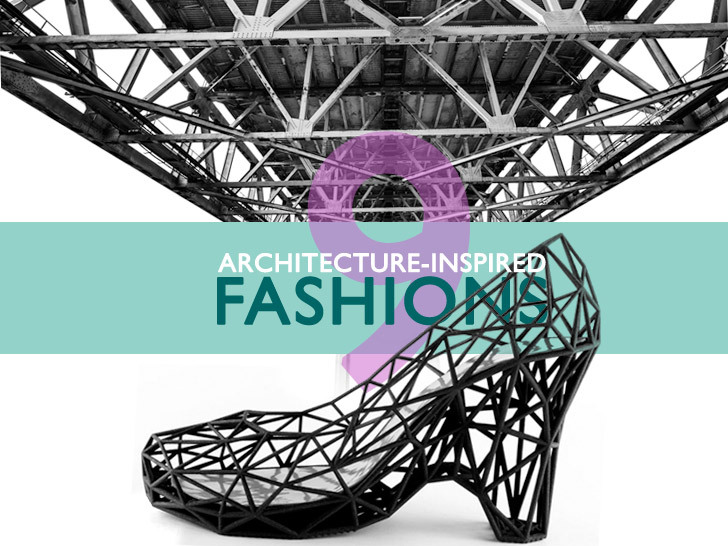 Fashion and architecture are more than casual acquaintances. Both disciplines entail filling voids with contours, swoops, and planes, albeit on markedly different scales. Sometimes, however, the cross-pollination of concepts is intentional. As fashion terms like "draping," "weaving," and "pleating" propagate throughout the architectural world, and methods of building construction incorporate themselves into garment-making, the relationship between the two grows more intimate by the day. From bridge-like pumps to a hat based on the London Zoo's penguin exhibit, here are nine examples of their love affair. For "Crescent Rising," CrOp by David Peck's Spring/Summer 2012 collection, designer David Peck drew his cues from New Orlean's vibrant landscape and architecture, including the historic Monteleone Hotel, whose Beaux-Arts friezes inspired one of his prints. Marmol Radziner's line of jewelry isn't just inspired by architecture, it's derived from actual construction scrap. 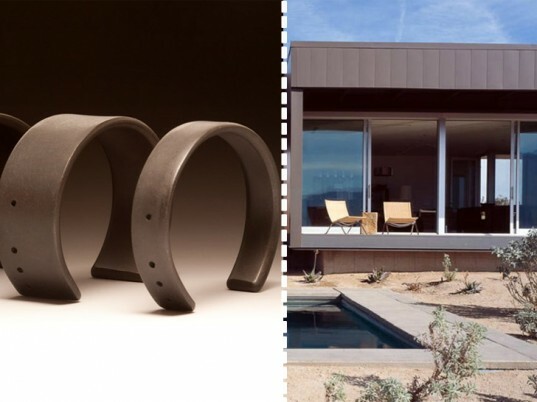 The unisex rings and bracelets echo the sleek, fuss-free silhouettes of the design-build firm's award-winning prefabs, resulting in personal architectural fragments that "evolve in response to [their] wearer," according to Ron Radziner. When Yesterday's News commissioned Lara Miller to create a tea-dyed frock out of newspaper, the Chicago designer didn't have to look far for inspiration. Her muse? 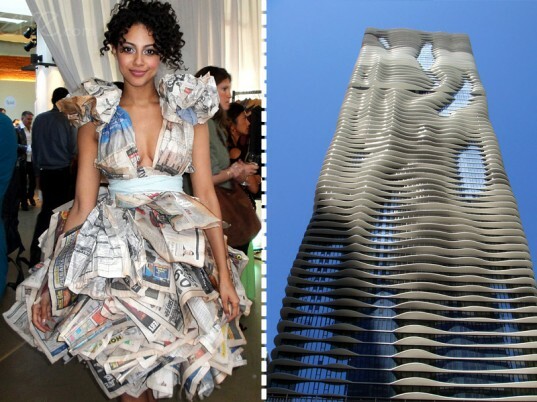 The Aqua, a Leadership in Energy and Environmental Design-certified "post-architectural" skyscraper by award-winning architect Jeanne Gang. 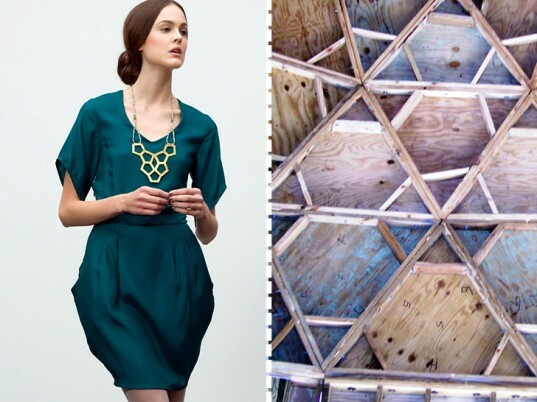 Project Runway winner Gretchen Jones counts the geodesic structures of Buckminster Fuller among her myriad influences, particularly with her Fall/Winter 2011 debut collection. Jones had a hand in the jewelry that complements each look, several of which harken to Fuller's self-bracing triangular forms. 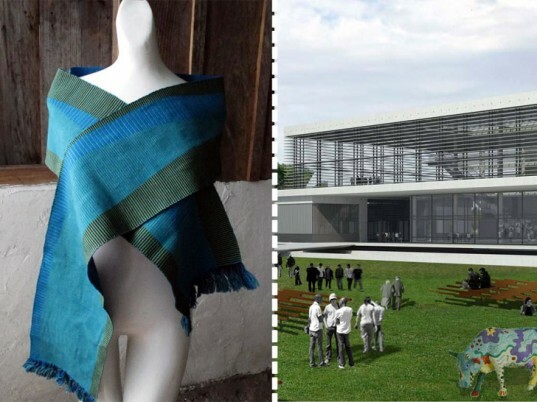 Galia Solomonoff was among the architects who lent their expertise to the 2011 "Scarfitecture" project, a cross-cultural initiative designed to fete the skills and abilities of artisans in Guatemala. Solomonoff based her design on the structural roof she designed for the Biblioteca Central del Bicentenario de la Ciudad in Rosario, Argentina. Reduced to abstract lines, the design morphed into a color-blocked shawl in soothing hues of blue. It should come as little surprise that Gaetano Pesce's first foray into footwear follows the same mold as his trademark modular designs. 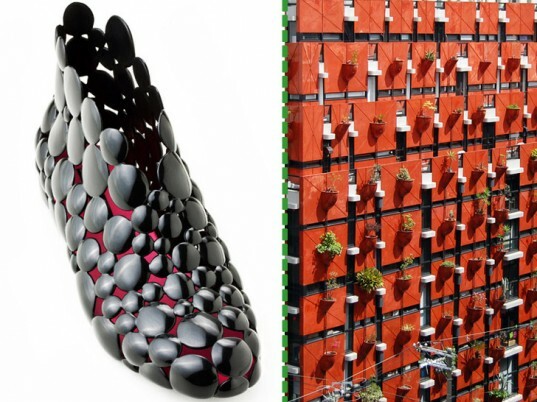 The Italian architect's "DIY bootie" for Melissa Plastic Dreams shares a thematic synergy with his plant-covered Organic Building in Osaka, Japan. Both feature undulating, interlocking components that can be tweaked individually at will. 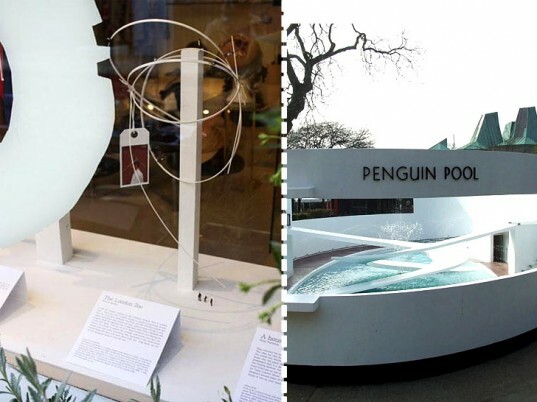 For Hat-itecture, a 2010 pop-up exhibit that explored the intersection between hats and architecture, the architects at Feix & Merlin created a one-off topper that recalled the Lubetkin Penguin Pool at the London Zoo. "This city is full of these incidental and fleeting moments, we wanted to capture the complex intertwined lives that Londoners lead and create something that responded to the intertwined relationships we have with each other every day," say Julia Feix and Tarek Merlin. "Because deep down, we are all just little penguins trying to find our way." Talk about a shoe fit for a modern-day Cinderella. Made to order from three-dimensionally printed nylon, Continuum Fashion's "Strvct" features the same triangulated buttressing that gives bridges their strength. Unlike actual bridges, however, the pump is wearable. Lined with a patent-leather inner sole, the shoe includes a coating of synthetic rubber on the bottom for traction.